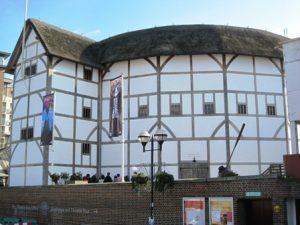 Shakespeare’s Globe is a reconstruction of an Elizabethan playhouse located on the south bank of the River Thames to the east of the Millennium Bridge and to the west of Southwark Bridge. The original playhouse known as the Wooden O was situated close to the current site and was destroyed by fire (caused by a cannon shot on stage during a performance of Henry VIII) in the 17th century. The reconstruction is based as closely as possible on the original and performances do not use modern props such as microphones or artificial lighting. Shakespeare’s Globe is open every day except when matinee performances are being held. There is a charge for admission.